BACKGROUND AND PURPOSE: To date, the demonstration of Rosenthal fibers on brain biopsy or autopsy specimens is considered a prerequisite for a definitive diagnosis of Alexander disease. We initiated a multiinstitutional survey of MR abnormalities in both presumed and confirmed cases of Alexander disease to assess the possibility of an MR-based diagnosis. METHODS: MR imaging studies in three patients with an autopsy-based diagnosis of Alexander disease were analyzed to define MR criteria for the diagnosis. These criteria were then applied to 217 children with leukoencephalopathy of unknown origin. RESULTS: Five MR imaging criteria were defined: extensive cerebral white matter changes with frontal predominance, a periventricular rim with high signal on T1-weighted images and low signal on T2-weighted images, abnormalities of basal ganglia and thalami, brain stem abnormalities, and contrast enhancement of particular gray and white matter structures. Four of the five criteria had to be met for an MR imaging-based diagnosis. In a retrospective analysis of the MR studies of the 217 patients, 19 were found who fulfilled these criteria. No other essentially new MR abnormalities were found in these patients. In four of the 19 patients, subsequent histologic confirmation was obtained. The clinical symptomatology was the same in the patients with and without histologic confirmation and correlated well with the MR abnormalities. MR abnormalities were in close agreement with the known histopathologic findings of Alexander disease. CONCLUSION: The defined criteria are sufficient for an in vivo MR imaging diagnosis of Alexander disease; only in atypical cases is a brain biopsy still necessary for a definitive diagnosis. Alexander disease is a rare, nonfamilial leukoencephalopathy that typically presents with frontal preponderance of white matter abnormalities and macrencephaly. Since the first description of this disease by Alexander in 1949 (1), different clinical subtypes have been recognized. Most of the reported cases have been the infantile variant, with early onset of macrocephaly and rapid neurologic deterioration leading to early death (1–14). A neonatal variant has been distinguished that is even more rapidly fatal (15). A less frequently reported subtype is the juvenile variant, in which macrocephaly is a less consistent feature and onset of neurologic deterioration occurs later in childhood and is less rapid (16–21). Several instances of an adult variant have also been described (19, 22–24). Laboratory investigations are not helpful in establishing the diagnosis of Alexander disease. The hallmark of the disease is the presence of Rosenthal fibers throughout the CNS. Rosenthal fibers are abnormal intracytoplasmic proteinaceous inclusions in fibrous astrocytes that have a distinctive hyaline appearance under the light microscope (1–3) and a granular electron-dense quality under the electron microscope (5, 19). Demonstration of Rosenthal fibers on histologic examination is considered a prerequisite for a definitive diagnosis. There are obvious disadvantages associated with a diagnosis that is limited to histologic confirmation. A brain biopsy, which is an invasive procedure, is a diagnostic necessity, especially in cases of slow progression. The only other option is to wait for postmortem examination. MR imaging is known for its high sensitivity and specificity in identifying white matter disorders (25, 26). We initiated a multiinstitutional survey of MR imaging patterns in both presumed and confirmed cases of Alexander disease to assess the possibility of providing criteria for an MR imaging-based diagnosis. MR studies of three patients with a histopathologically confirmed diagnosis of Alexander disease were available and formed the basis of the defined MR imaging criteria. These criteria were then applied to 217 children with leukoencephalopathy of unknown origin whose MR studies we had received for review. In these patients, well-known causes of childhood leukoencephalopathy had been excluded by means of the following laboratory examinations: urine organic acids, including N-acetyl aspartate; plasma amino acids; serum lactate and pyruvate; very long-chain fatty acids; and arylsulfatase A, galactocerebrosidase, β-galactosidase, and β-hexosaminidase activity. Patients who fulfilled the MR imaging criteria were selected for further evaluation. All MR studies were examined retrospectively using a list of many anatomic white and gray matter structures (27), which were scored as either normal or abnormal. In addition, other characteristics were scored (27), including swelling and atrophy of white and gray matter structures, presence of cysts, and contrast enhancement. The criterion for swelling of cerebral white matter was volume increase with broadening of the gyri. The criterion for swelling of the basal ganglia and thalamus was volume increase with compression of the ventricles. The criterion for atrophy was volume decrease with widening of the ventricles and subarachnoid spaces. By comparing the images of the patients, we determined the relative severity of characteristics, such as swelling, atrophy, signal change, and contrast enhancement, and distinguished two grades: 1) clearly present, and 2) slight to mild. In the analysis, we divided the MR studies into early and late, based on whether they were obtained before or soon after the onset of neurologic deterioration or late in the course of the disease. All images were reviewed independently by two investigators, and consensus was reached when there was a disagreement between their interpretations. The medical histories and clinical findings were documented, including onset of clinical symptoms and disease course, presence of mental and motor problems, signs of bulbar dysfunction, epilepsy, head circumference, height, and weight. Of the three patients with an autopsy-confirmed diagnosis, two had the severe form of infantile Alexander disease and one had the more protracted course of juvenile Alexander disease (Table 1). In the two patients with the infantile variant, the clinical symptomatology was dominated by failure of normal development, seizures, serious feeding problems, macrocephaly, and rapid neurologic deterioration. The patient with juvenile Alexander disease showed signs of mild developmental delay in infancy. Onset of neurologic deterioration was delayed and gradual. Signs of bulbar dysfunction became prominent, including speech problems, bouts of vomiting, and progressive swallowing difficulties, eventually necessitating tube feeding. Spasticity and cerebellar ataxia arose late in the course of the disease, and the patient remained normocephalic. Two MR studies were obtained in the two patients with infantile Alexander disease, in one patient at an early stage and in the other patient at a late stage of the disease (Table 2). The early MR study (Fig 1) showed that the frontal white matter had a slightly higher signal intensity than normal unmyelinated white matter on T2-weighted images and slightly lower signal intensity on T1-weighted images. Other findings included signal abnormality and some swelling of the basal ganglia, a periventricular rim of low signal intensity on T2-weighted images and high signal intensity on T1-weighted images, and areas of signal abnormality in the brain stem, including the medulla and the entire area of the midbrain, except for the red nuclei (Fig 1). After contrast administration, enhancement was found in the ventricular lining, periventricular rim, parts of the frontal white matter, caudate nucleus, thalamus, dentate nucleus, parts of the midbrain, fornix, and optic chiasm (Fig 1). The most striking findings on the late, as compared with the early, MR studies included tissue loss, producing a thinner periventricular rim, cystic degeneration of the frontal white matter, and atrophy of the basal ganglia, thalamus, pons, and cerebellum. Areas of signal abnormality were again seen in the brain stem, including the posterior part of the midbrain and the central part of the medulla. Distinctive findings on this late MR study were large, apparently arachnoid, cysts in the sylvian fissure, in combination with a cystic enlargement of a cavum septi pellucidi and cavum vergae. In the patient with juvenile Alexander disease, three MR studies were available, one obtained early in the course of the disease and two at a late stage (Table 2). All MR images showed extensive cerebral white matter changes with a frontal predominance and relative sparing of occipital and temporal white matter (Fig 2). The early MR study (Fig 2A) showed a periventricular rim with low signal intensity on T2-weighted images and high signal intensity on T1-weighted images. The basal ganglia and thalami were mildly abnormal in signal intensity and mildly swollen. Areas of signal abnormalities were seen in the posterior part of the medulla. On the two late MR studies, the distribution and extent of the white matter abnormalities were essentially the same (Fig 2B–D). 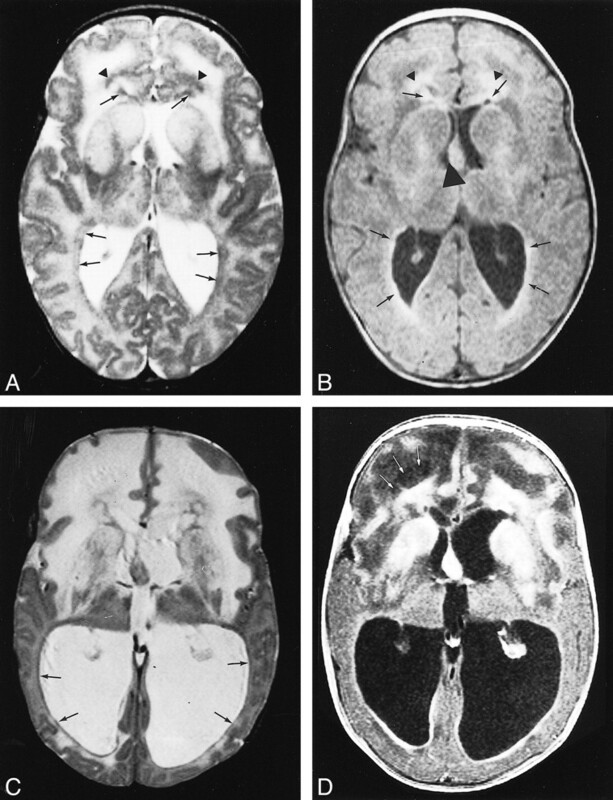 Progression of disease was characterized mainly by tissue loss with cystic degeneration of the frontoparietal white matter and enlargement of the lateral ventricles (Fig 2). The mildly elevated signal intensity on T2-weighted images and swelling of the basal ganglia and thalami were replaced by low signal intensity and atrophy (Fig 2). On the basis of these MR findings we defined five MR imaging criteria: 1) extensive cerebral white matter abnormalities with a frontal preponderance, either in the extent of the white matter abnormalities, the degree of swelling, the degree of signal change, or the degree of tissue loss (white matter atrophy or cystic degeneration); 2) presence of a periventricular rim of decreased signal intensity on T2-weighted images and elevated signal intensity on T1-weighted images; 3) abnormalities of the basal ganglia and thalami, either in the form of elevated signal intensity and some swelling or of atrophy and elevated or decreased signal intensity on T2-weighted images; 4) brain stem abnormalities, in particular involving the midbrain and medulla; and 5) contrast enhancement involving one or more of the following structures: ventricular lining, periventricular rim of tissue, white matter of the frontal lobes, optic chiasm, fornix, basal ganglia, thalamus, dentate nucleus, and brain stem structures. We required that four of the five criteria be fulfilled for an MR imaging-based diagnosis to allow for the facts that it may be difficult or impossible to assess the presence and extent of white matter changes in very young infants and that not all patients may have had contrast-enhanced studies. It is important to realize that in young infants white matter abnormalities may not yet be evident. Both normal, unmyelinated, and abnormal white matter have high signal intensity on T2-weighted images and low signal intensity on T1-weighted images, making differentiation between normal and abnormal white matter difficult. Also, assessment of relative sparing of occipital and temporal white matter is difficult or impossible in young infants, as occipital U fibers only become myelinated in the second half of the first year of life and the temporal white matter becomes myelinated in the course of the second year. It may therefore not be possible to assess the presence of frontal predominance in early infancy. The criteria would allow an MR imaging-based diagnosis in young infants. It is not common practice to administer contrast material to patients with leukoencephalopathy, and the criteria would also allow an MR imaging-based diagnosis in the absence of contrast-enhanced studies. Among the 217 patients with leukoencephalopathy of unknown origin, 19 fulfilled the MR imaging criteria. Five of them had a severe disease course and 14 had a milder and more protracted disease course (Table 3). In the five patients with severe disease, the symptomatology was dominated by failure of normal development, seizures, feeding problems, macrocephaly, and rapid neurologic deterioration. A brain biopsy was performed in one patient and disclosed Rosenthal fibers. Autopsy confirmation of the diagnosis of Alexander disease was obtained in two other patients. All 14 patients with mild disease showed some signs of mild neurologic dysfunction in infancy, mainly developmental delay and epileptic seizures. Onset of clinical neurologic deterioration was delayed and gradual in all patients. Signs of bulbar dysfunction became prominent. Speech problems were always present, starting with delayed speech development, progressing to dysarthria, and ending in loss of speech. Increasing problems with swallowing were frequent, often leading to insufficient gain or loss of weight, and culminating with tube feeding. Bouts of vomiting, particularly during morning hours, occurred in 40% of the patients. Macrocephaly was not invariably present. Three children have remained normocephalic. Autopsy confirmation of the diagnosis of Alexander disease was obtained in one of the 14 patients. Thirty-seven MR imaging studies were available in these 19 patients, eight in the five patients with a severe disease course and 29 in the 14 patients with a mild disease course (Table 4). In the patients with severe disease, five early MR studies and three late MR studies were available. 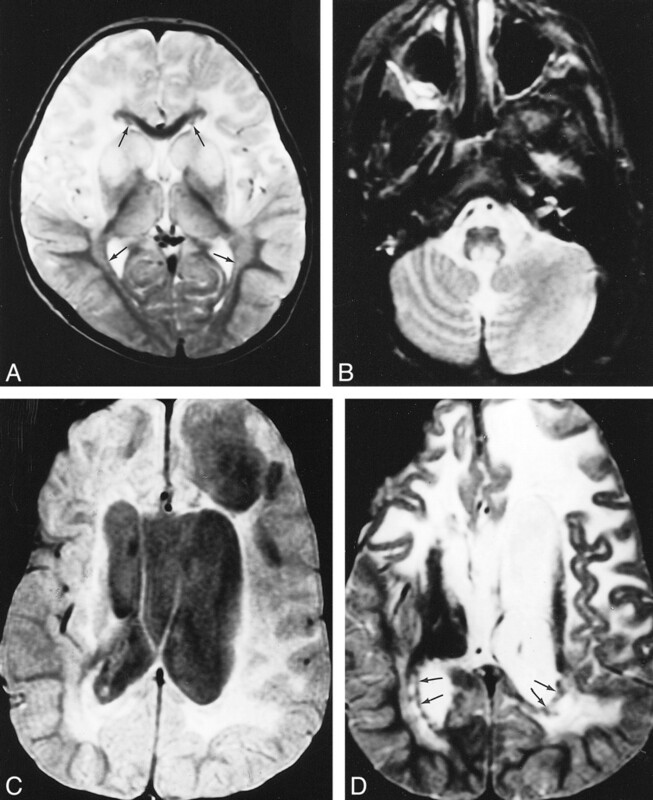 Early MR findings (Fig 3A and B) included a periventricular rim with low signal intensity on T2-weighted images and high signal on T1-weighted images; signal changes and mild swelling of the basal ganglia and thalami, most pronounced in the head of the caudate nucleus and putamen; and areas of signal abnormality in the brain stem, most frequently involving the midbrain and medulla. One patient received contrast material, which produced enhancement of the periventricular rim, parts of the frontal white matter, parts of the basal ganglia, a midbrain lesion, the optic chiasm, and fornix. In three patients, the cerebral white matter did not have an abnormal signal intensity on early MR studies considering its unmyelinated state for being unmyelinated. In one of these patients, the periventricular rim was more prominent in the frontal area with greater contrast enhancement than in the parietooccipital area, but in the other two patients there was no frontal predominance in any aspect. Both the latter patients also had late MR studies, which showed more prominent signal abnormality of the cerebral white matter, with an evident frontal predominance in the degree of signal change, and swelling; in one, there was also the beginning of cystic degeneration. The late MR studies showed signs of atrophy with enlargement of the lateral ventricles and atrophy of the basal ganglia and thalamus (Fig 3C and D). Contrast enhancement on the late MR studies involved the periventricular rim, the frontal white matter, parts of the frontal cortex, the head of the caudate nucleus, the putamen, and a midbrain lesion. In the 14 patients with mild disease, 20 early MR studies and nine late MR studies were available. Three patients had a prolonged follow-up of 4 to 8 years with 12 MR examinations documenting abnormalities from late infancy, before onset of neurologic deterioration, up to an advanced stage of the disease. The 20 early MR studies showed extensive cerebral white matter changes with frontal predominance and relative sparing of the occipital and temporal white matter in almost all patients (Fig 4). The basal ganglia were involved in all cases, invariably affecting the head of the caudate nucleus and putamen, often also affecting to a lesser extent the globus pallidus and thalamus. This was always characterized by a mild signal change and in most cases also by mild swelling. Brain stem lesions were seen in eight of the 10 patients. Most frequently affected were the midbrain (in the anterior part, the periaqueductal region, or the entire area except for the red nuclei and colliculi) and the medulla (either in the posterior or central part). The pontine tegmentum was affected in some patients. Two patients received contrast material, which produced subtle enhancement in one of them and more prominent enhancement in the other. The enhancing areas included a variable combination of foci in the frontal white matter, caudate nucleus, putamen, globus pallidus, brain stem lesions, and intraparenchymal trajectories of the trigeminal nerve (Fig 5). Note that the complete picture was already present on early MR studies obtained during the stage of minimal neurologic dysfunction, sometimes years before the onset of neurologic deterioration. On the late MR studies, the extent of the white matter abnormalities was more or less the same as on the early studies (Fig 6). The main changes in comparison to the early MR examinations consisted of signs of tissue loss with cystic degeneration of the frontal white matter, enlargement of the lateral ventricles, cerebellar atrophy, and brain stem atrophy. The cysts in the frontal white matter became very large in one patient, and were less impressive in four patients. The slightly elevated signal intensity on T2-weighted images and the swelling of the basal ganglia and thalami were gradually replaced by low signal intensity and atrophy (Fig 6). In end-stage disease, the basal ganglia and thalami were reduced to thin rims. One patient received contrast material, which produced enhancement in the ventricular lining, multiple areas of the brain stem, the dentate nucleus, and the cerebellar cortex (Fig 6). We started our investigation with MR imaging studies of three patients in whom the diagnosis of Alexander disease had already been proved histologically. On the basis of these findings, five MR imaging criteria were defined that allowed the identification of another 19 patients from a cohort of 217 children with leukoencephalopathy of unknown origin. The MR imaging pattern observed in this group of 19 patients was very homogeneous and identical to the pattern observed in the first three patients. After a preliminary diagnosis of Alexander disease was made on the basis of typical MR findings, the diagnosis was subsequently confirmed histologically in four of the 19 patients. The MR imaging pattern is quite specific, dissimilar from patterns observed in other white matter disorders, either with known (25, 26) or unknown (27) origins. 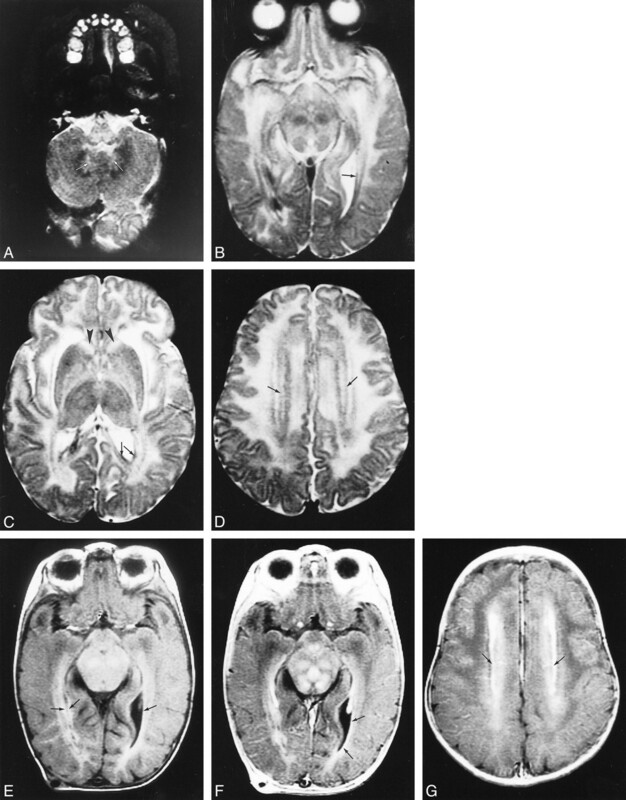 In a study of 92 patients with leukoencephalopathy of unknown origin (27), 11 had the above MR imaging picture. Statistical analysis showed that the pattern was significantly different from the MR imaging patterns observed in the rest of the patients (27). Several white matter disorders with known pathogeneses share some of these MR imaging characteristics, but none shares all of them. A predominant involvement of the frontal lobes together with involvement of diencephalic nuclei and brain stem tracts, as well as contrast enhancement may be observed in X-linked adrenoleukodystrophy (26). However, in this disorder, only or mainly the lateral geniculate bodies are involved among the diencephalic nuclei. The brain stem lesions primarily involve the corticospinal, corticobulbar, visual, and auditory tracts (28, 29). Contrast enhancement occurs within the outer border of the white matter lesion (26). Similarly, some patients with metachromatic leukodystrophy have predominantly frontal white matter abnormalities together with involvement of the brain stem (26). The brain stem lesions involve the long tracts. Contrast enhancement is not a feature of this disease. Canavan disease is characterized by a combination of macroencephaly, extensive cerebral white matter changes (without frontal preponderance), and basal ganglia abnormalities (26). However, the thalamus and globus pallidus are involved with typical sparing of the putamen and caudate nucleus (26). Contrast enhancement does not occur. In merosin-deficient congenital muscular dystrophy, extensive cerebral white matter changes are present with relative sparing of the occipital white matter (30). However, the basal ganglia and brain stem are spared (30). In vacuolating leukoencephalopathy with subcortical cysts, extensive cerebral white matter changes are observed with slight swelling (31). However, there are invariably anterotemporal cysts and often subcortical cysts in the frontoparietal border zone (31). 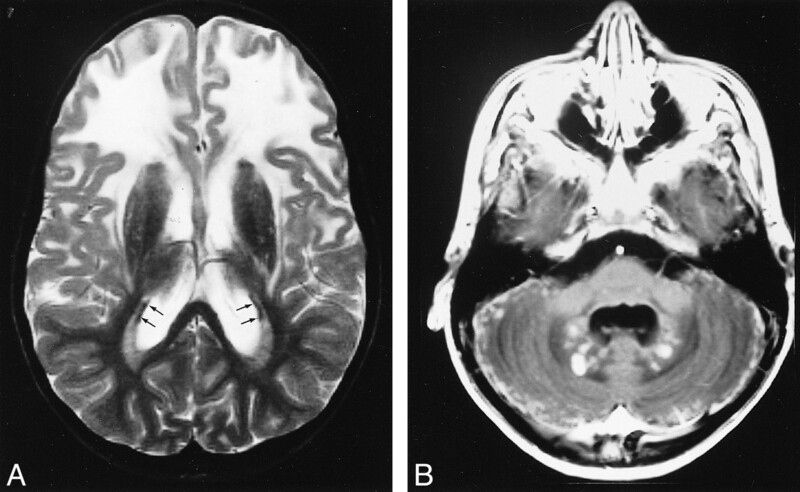 In contrast, the cysts in Alexander disease affect primarily the deep frontal white matter. Thus, all the above disorders can be distinguished from Alexander disease on the basis of MR imaging criteria. MR findings have been published in several cases of infantile Alexander disease (7–9, 11, 14, 32, 33) and in a few cases of juvenile Alexander disease (21, 34) with histologic confirmation. Apart from a study by Gingold et al (32), none of the reports describes in detail abnormalities other than those involving the white matter, but the published images show abnormalities that are similar to those found in our patients. Images showing brain stem abnormalities and contrast-enhanced studies have been limited to the report of Gingold et al (32). These authors described signal abnormalities in the periaqueductal gray matter and contrast enhancement in the periventricular white matter, deep frontal white matter, basal ganglia, and brain stem areas. None of our patients had MR examinations shortly before death. Therefore, we are not able to provide a direct comparison between MR and histopathologic findings in any of our patients. However, autopsy findings have been reported in many cases of Alexander disease. In the infantile variant, the brain is typically too large and too heavy. Extensive paucity of myelin is observed in the cerebral hemispheres, with the frontal lobes affected more severely than the occipital and temporal lobes (3, 13). In the noncystic areas, axons are intact (3, 10). Myelin paucity can be observed to a variable extent in the cerebellar white matter, the hilus of the dentate nucleus, and areas of the brain stem. There are few signs of active myelin breakdown: phagocytes are not increased in number and, in most cases, no sudanophilic breakdown products or inflammatory cells are seen. This is more consistent with a failure of myelin formation than with myelin breakdown (3, 13). A striking increase in astrocytes filled with Rosenthal fibers is seen throughout the brain, with a preferential subpial, perivascular, and subependymal pattern. The greatest density of Rosenthal fibers is seen in the outer, subpial layers of the cerebral cortex (3, 10), frontal white matter (3, 6), periventricular region (3, 35), basal ganglia and thalami (2, 3, 13), and brain stem (3, 6, 13). Astrocytes containing Rosenthal fibers may surround and disrupt the ependyma of the aqueduct, resulting in narrowing of its lumen and obstructive hydrocephalus (6). Deposition of Rosenthal fibers in the cerebellum is variable, being sparse in some cases (2) and, in others, present to a great extent in the cerebellar white matter (3), dentate nucleus (3), or, rarely, the subpial layers of the cerebellar cortex (13). The fornix (3) and optic nerves, chiasm, and tracts (5) may contain many Rosenthal fibers. The peripheral or schwannian parts of the other cranial nerves are always free of Rosenthal fibers, whereas the intraparenchymal root bundles may contain heavy depositions (3, 5). Similar autopsy findings in patients with extensive white matter disease and Rosenthal fiber deposition have been described in several juvenile (5, 19–21) and adult (36) cases. Incidentally, a greatly expanded cavum septi pellucidi and cavum vergae are seen bulging into the lateral ventricles (1, 2). The autopsy findings in our patients were in agreement with the above description. These autopsy reports correspond to the MR imaging findings in all our patients, including those with histologically confirmed and MR imaging-based diagnoses. Considering the histologic observations, a failure of normal myelination is most likely to be responsible for at least part of the abnormal white matter signal on MR images. This also explains the presence of extensive leukoencephalopathy on early MR imaging studies in juvenile disease. Another observation is that in the juvenile patients, clinical deterioration was not accompanied by an increase in the extent of the white matter changes on MR images, as would have been expected in progressive myelin loss. However, the affected white matter has higher signal on T2-weighted images and lower signal on T1-weighted images than does normal, unmyelinated, white matter. Therefore, the signal abnormality of the white matter cannot be explained by hypomyelination alone. Hyperplasia and hypertrophy of astrocytes and Rosenthal fiber deposition are probably contributing factors. The periventricular rim of low signal intensity on T2-weighted images and high signal intensity on T1-weighted images is probably due to an extreme density of Rosenthal fibers in the periventricular white matter. Numerous Rosenthal fibers are probably responsible for the signal abnormality and swelling of the basal ganglia and thalamus. It remains unclear why the periventricular rim has a different signal behavior. Brain stem abnormalities are a consistent finding on both MR images and histopathologic sections. The areas that show contrast enhancement are those with the highest density of Rosenthal fibers. The same observation was made by Farrell et al (6), who attributed the contrast enhancement to insufficiency of the blood-brain barrier due to impaired function of astrocytic footplates, the main location of Rosenthal fibers. The clinical symptomatology was the same in patients with and without histologic confirmation of Alexander disease. The symptoms were also similar to those described previously in patients with a histologically confirmed diagnosis (1–3, 5, 6, 13, 16, 35). Among our patients, the clinical severity of disease was highly variable. The distinction between severe and mild cases was not always clear. Some of the severely affected patients had a slower progression of disease than others, and some of the mildly affected patients had a more rapid disease course than others. The clinical symptoms were qualitatively the same in both severe and mild cases. Macrocephaly was present in all severely affected patients and in most mildly affected patients; it can be ascribed to the macroencephaly and generalized white matter swelling as depicted by MR imaging, with a component of obstructive hydrocephalus in some patients. The white matter swelling has usually been attributed to the accumulation of Rosenthal fibers, but astrocytic hyperplasia is a contributing factor (35). A few mildly affected patients remained normocephalic; they had less severe white matter swelling and no ventricular enlargement on MR images. Early in the course of the disease, our patients, in particular the ones with late-onset disease, displayed only a few signs of white matter abnormalities. Spasticity and ataxia were usually late findings, occurring in the stage of cystic degeneration and atrophy of the white matter. Signs of brain stem dysfunction were often relatively early findings. They are in agreement with the signal abnormalities in that area, shown by MR imaging from an early stage onward. In several children, signs of extrapyramidal dysfunction were noted, although they were not prominent. These may be ascribed to abnormalities of the basal nuclei as evidenced by MR imaging and autopsy findings. Epileptic seizures were also consistent findings of the disease, pointing to cortical dysfunction. The cerebral cortex is known to contain numerous Rosenthal fibers in its outer layers, and in one case we found cortical enhancement on postcontrast MR images. Mental retardation and behavioral problems may be related to the frontal white matter disease, cortical abnormalities, or a combination of these. We have defined MR imaging criteria on the basis of findings in patients with a histologically confirmed diagnosis of Alexander disease. We have shown that application of these criteria to patients with leukoencephalopathy of unknown origin leads to the identification of similar cases. We have demonstrated the accuracy of the criteria by subsequently providing histologic confirmation in several of the patients with an MR imaging-based diagnosis. The specificity of these MR imaging characteristics had already been demonstrated in a previous study of a large number of patients with leukoencephalopathy of unknown origin (27). We have shown that the clinical symptoms of the patients with a histologically based diagnosis and with an MR imaging-based diagnosis are the same and in agreement with MR imaging abnormalities and histopathologic findings. The only new finding among the 19 patients identified with the previously defined criteria concerned the areas of contrast enhancement. Apart from the structures mentioned in the inclusion criteria, contrast enhancement was observed in the cerebral and cerebellar cortex and intraparenchymal parts of cranial nerves. We concentrated on patients with typical MR findings of Alexander disease. It is possible or even probable that we did not recognize atypical cases of Alexander disease, because they did not fulfill the inclusion criteria. Both juvenile (17–19) and adult (19, 22–24) patients have been seen in whom Rosenthal fibers were evident at autopsy despite minimal or absent white matter changes. MR imaging also has shown minimal or no white matter abnormalities in such cases (37, 38). In addition, possible variants of Alexander disease have been described with predominantly cerebellar involvement (39). It is difficult to decide whether these atypical cases are in fact Alexander disease or not (40). The problem is that Rosenthal fibers are not restricted to Alexander disease but may occur in several other chronic conditions, including multiple sclerosis (19), tumors (41), and drug toxicity (42). At present, there is no biochemical marker for Alexander disease. It is known that major components of Rosenthal fibers are stress proteins (ie, αB-crystallin and HSP27) (43, 44). HSP27 and αB-crystallin have been reported to be elevated in the CSF (45); however, the sensitivity and specificity of this test is not known and as such its diagnostic contribution has not been assessed. With the present state of knowledge, it is not possible to determine whether patients with extensive, preponderantly frontal cerebral leukoencephalopathy and Rosenthal fibers on histopathologic examination and patients with Rosenthal fibers but without extensive cerebral leukoencephalopathy have different diseases or variants of the same disease. Our final conclusion is that if a patient fulfills the MR imaging criteria set forth in this study, it is justified to presume a diagnosis of Alexander disease without histologic confirmation, and that only in atypical cases of the disease is a brain biopsy still necessary for a definitive diagnosis. We thank all the physicians who referred patients and all the neuropathologists who provided histologic confirmation for their collaboration. 1 Address reprint requests to M. S. van der Knaap, MD, Department of Child Neurology, Free University Hospital, P.O. Box 7057, 1007 MB Amsterdam, the Netherlands.